Welcome All Quilt National Artists! Starting today, you can find a list of every Quilt National artist included in the Quilt National artist A-Z section of our website. That’s right! Every one, from the very beginning — all in one place. Providing a one-stop-shopping opportunity for anyone interested in the artwork of the Quilt National artists community was our first priority, and now we are well on our way. Click on the “LEARN ABOUT THE ARTISTS” tab on the menu bar above and have a look for yourself. The new table contains 745 listings of artists and jurors from every Quilt National exhibition. In addition, each artist listing shows the names of the Quilts exhibited, and the years they were shown. Links to artists websites have been included for every artist who has provided this information to quiltnationalartists.com. We are currently reaching out to all Quilt National artists in order to increase the number of websites in the directory listing. If you are a Quilt National artist with a website that you wish linked in the directory, please let us know by using the website contact form. For many years collector Marvin Fletcher has maintained an archive of every artist, every quilt and every award winner associated with Quilt National. When we contacted him, he generously offered to help us in developing our own sortable table of information. Kathleen Dawson at the Dairy Barn provided us access to the Dairy Barn website and permission to use the information on quiltnationalartists.com. Based upon user feedback we have simplified the events calendar to be more readable at a glance. Changing the calendar format also helps to make the website run faster. Making the website easy to navigate and pleasant to use has been a design goal from the beginning. After changing the calendar and adding the new, expanded artists table, the site was further optimized to enhance performance and improve search engine rankings. The Quilt National Artists Community Gallery is a somewhat ambitious feature for a website run by volunteers. Still, we want to make a place for every quilt national artist to show their stuff. We are in the process of designing the gallery feature for the website in such a way that it is simple for an artist to submit their personal gallery page information through an online form, and also make it easy for us to put up individual gallery pages without a lot of manual intervention. Pretty soon we will be quietly beta testing the galleries on the website. Let us know how we are doing. 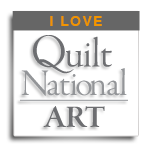 Leave a comment telling us what you think of the expanded A-Z quilt national artists feature.